Karla Repperger lives in Saint Peters, Missouri with her wonderful and talented husband, Dan, and their four "fur-children" (3 dogs and a cat). She graduated from Mizzou (in May 2000) with a Bachelor's of Science degree in Meteorology, however, due to the limited jobs available with the National Weather Service, she pursued a more technical career and currently works as a systems analyst for Edward Jones Investments. Karla has always had an interest in arts and crafts, but really found her niche in the summer of 2003. She decided to test her sewing skills by creating a Jack Sparrow costume for Halloween. Unfortunately, she ran into a snag when trying to locate a particular style of beads for the costume. Karla visited Glasshopper Studio (a local bead shop), and while they didn't have the beads she needed, they did offer classes in glass beadmaking. She signed up for the class, and it was love at first melt! Due to Karla's new addiction, the Jack Sparrow costume was never completed; instead she began building her own glass bead business. A year later, Karla began selling her work on eBay under the title SirWatson Designs; named after her dog, Watson. In June 2010, Karla decided to change her name to "Studio Solana" to give her business a new look and to incorporate a few other hobbies (i.e., knitting, sewing, etc.). "Solana" is a spanish word for "sunshine", which relates to Karla's love of the sun and outdoors. 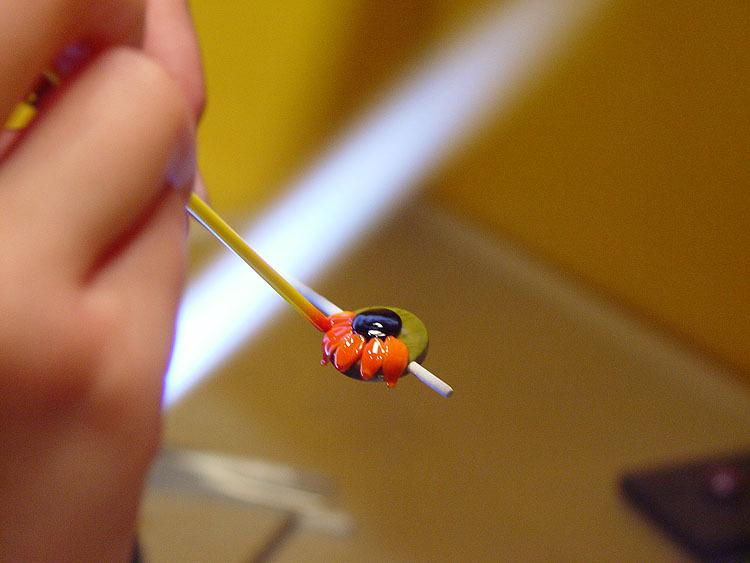 Glass bead-making is an ancient art that has been practiced for more than 3,000 years. In these earlier times, oil lamps were used to melt the glass, which is how manipulating molten glass became known as "lampworking". 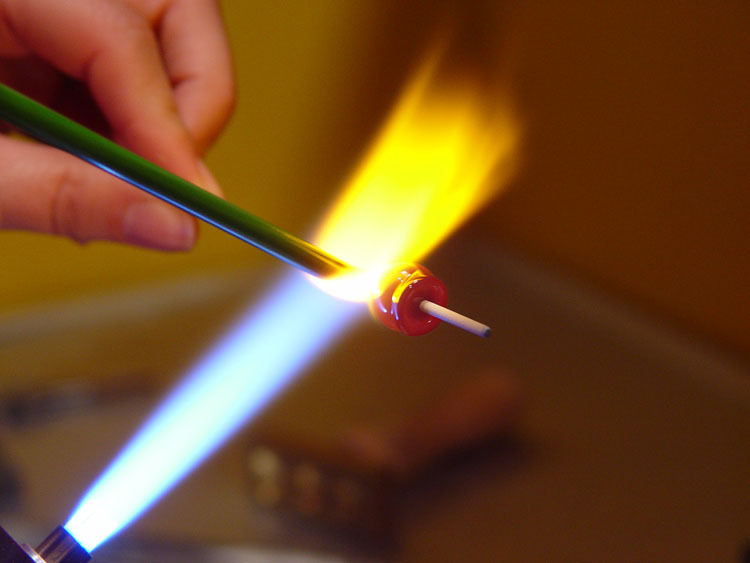 In modern lampworking, fuel/oxygen mix torches are used to melt colorful rods of glass at temperatures greather than 1,000°F. The molten glass is wound onto a stainless steel mandrel that has been dipped in a releasing agent (to prevent the glass from permanently adhering to the steel). Finished beads are annealed in a kiln that slowly brings down the temperature of the bead, which increases it's strength and durability. Once the bead is cool, the mandrel is removed, leaving a hole through the bead. Beads are made using colored glass rods in varying thicknesses. A coated mandrel is used to build the bead upon. 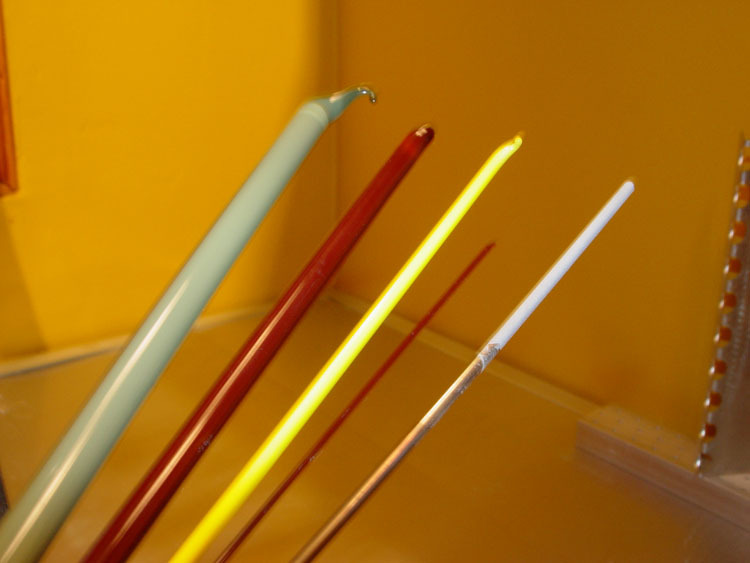 Colored rods are heated to temperatures over 1,000°F and the molten glass is wound onto the coated mandrel. Using thinner pieces of glass, the bead can be decorated in a variety of patterns including dots, lines, swirls, etc. 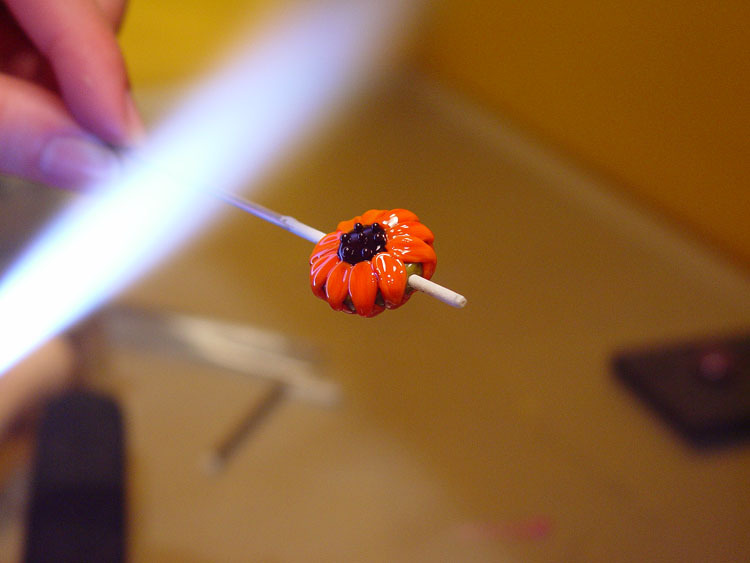 Once decorated, beads go into kiln to anneal (around 1,000°F) which strengthens the bead by removing stresses in the glass. Finished beads. These beads have been annealed and have had the coated mandrel removed (thus creating the holes).